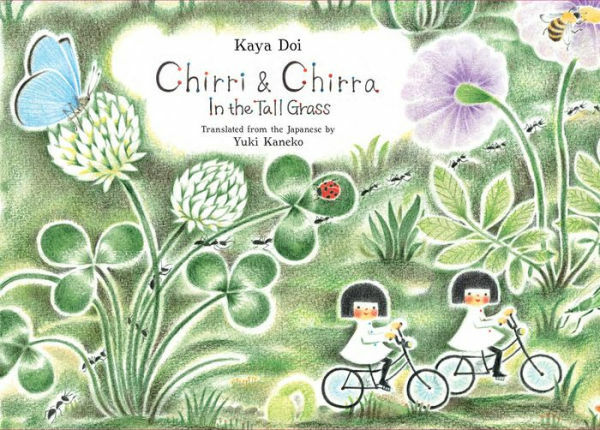 This summer I reviewed Chirri & Chirra and Chirri & Chirra In the Tall Grass written and illustrated by Kaya Doi and translated by Yuki Kaneko and ended up writing a discourse on the picture book itself. Doi's books are magical. They transport the reader. Doi combines adventure, community and comfort in her books, both in words and pictures. While rare in picture books today, these are the qualities that I find over and over in the picture books that I loved as a child. These are books that you will read over and over with a smile on your face every time. These I know that hygge is a Danish word/feeling ((pronounced hue-guh not hoo-gah) is a Danish word used when acknowledging a feeling or moment, whether alone or with friends, at home or out, ordinary or extraordinary, as cozy, charming or special, according to Hygge House), but Doi, who is Japanese, has hygge down. This is especially so in Chirri & Chirra The Snowy Day&. With their ever present, "Dring-dring, dring-dring!" 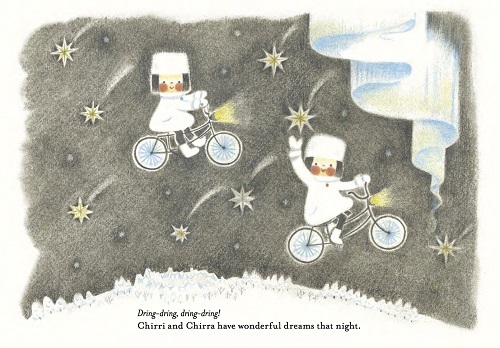 Chirri and Chirra are on their bicycles and adventuring out in the first snow of the season before the title page even arrives! 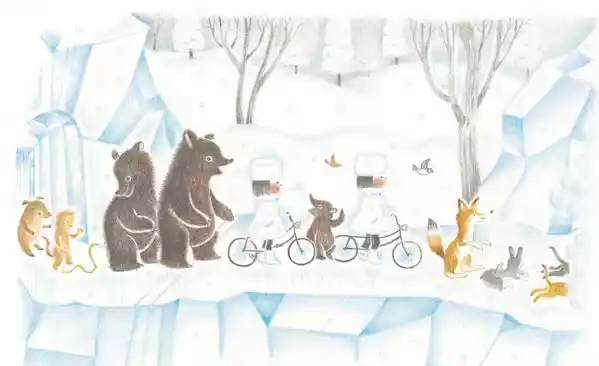 The girls pedal past the frozen pond into the forest where they find a door made of ice. Of course they go inside! 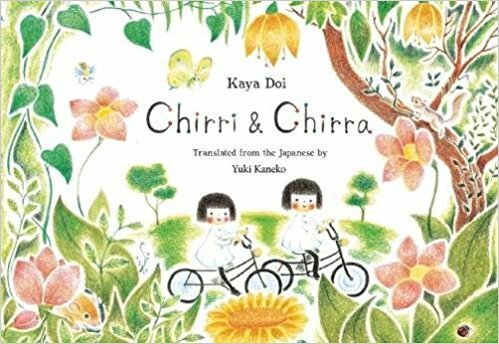 As with the previous books, Chirri and Chirra discover a welcoming world of flora and fauna on their adventures, first encountering a goat and a monkey handing out, "hot fruit punch with apples and cinnamon," while standing in front of a wall of all sorts of cups and mugs. Of course they give Chirri and Chirra cups that are, "just the right size for them." Pedaling to a great hall, they find animals doing all kinds of hygge things. 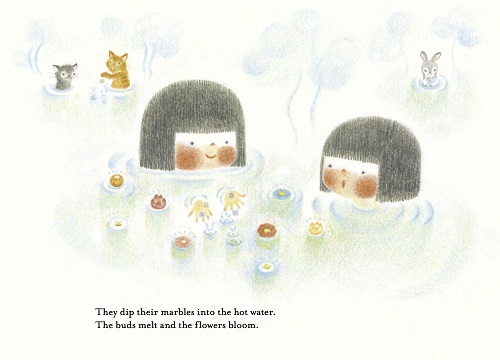 Chirri and Chirra join a game of marbles that are made from the, "frozen buds of many kinds of flowers." The illustrations of these marbles, which reappear in the story a few pages later, are beautiful in their simplicity and meaning. 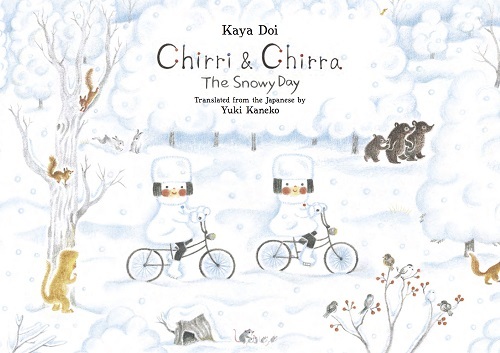 Each event in Chirri & Chirra The Snowy Day is more magical and wondrous than the next and I had to stop myself from revealing the whole plot here. There are more cozy moments and special treats that follow, including a village of igloos stocked with warm beds and a view of a winter sky filled with shooting stars. Please know that the illustrations shared here are not representative of the quality of the physical book itself, which a described at length in my previous review. This quality is representative of Enchanted Lion, a book-loving, family-owned publishing company based in Brooklyn dedicated to bringing international children's books that deliver "well told stories, and illustrations that open up the visual world and deepen a child's sense of story" to American readers.